step 2 and step 3 are actually intertwined. i have one terrible habit and that is splurging on the right things at the wrong times. in other words, a lack of prioritizing needlessly nice things over needed things. yes, play me the smallest violin ever. while i do crave a perfect working wardrobe of separates and polite shoes, i always ALWAYS cave into high fashion potential. i will spoil myself with shoes, whether i will wear them or stare at them. i will. splurge. NEED: only one multitasker for winter/work. 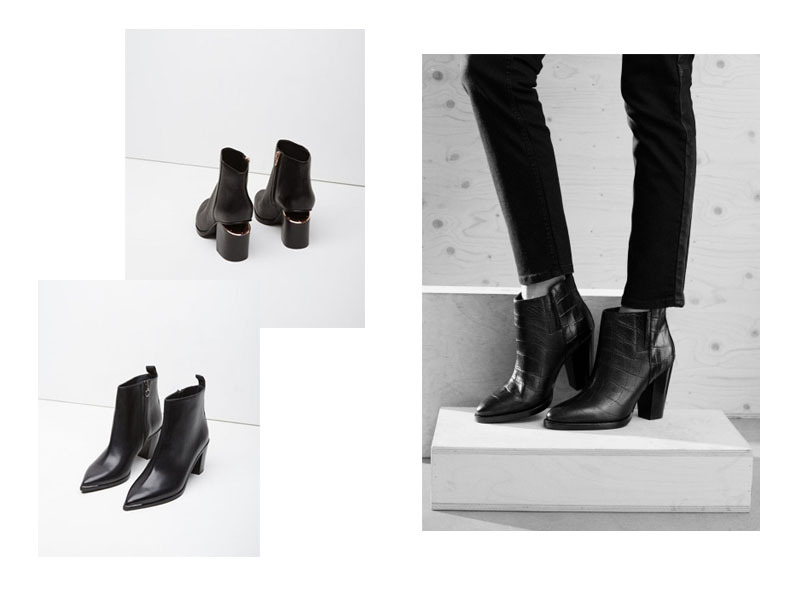 i’m thinking a simple, chelsea boot style with a chunky heel to be dressy or punky. maybe black, though ideally an eye catching hue or metallic for that beastly fashion craving. maybe the Lomis. price aint right dough. also the Gabi boots are sold out in my size EVERYWHERE. the faux-croc ones have a 10 cm/4 in heel that might be too much for everyday wear and i’m not sure about the fit as its h&m’s mid-tier division. bah, maybe just cheap ones will do until the right ones turn up. i’m okay with that since Korea makes awesome fur-lined ones anyway.